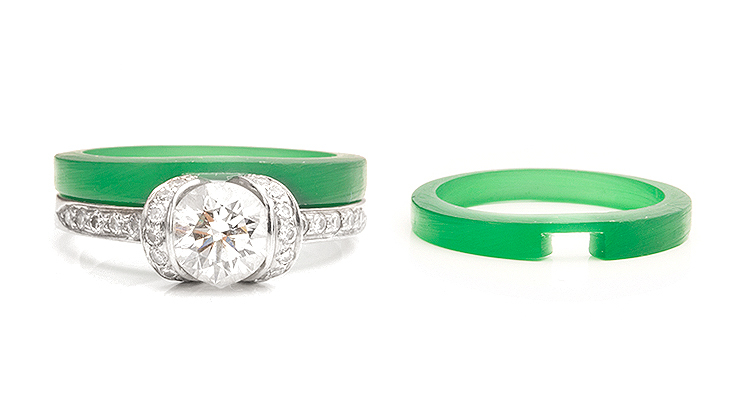 Get inspired and find the perfect shaped wedding ring. Many of our clients visiting us in Ryde, seek help to find the perfect shaped wedding ring. Many brides-to-be need expert help to source a wedding ring contoured to their existing engagement ring setting. One of our tailored services gives the precise help needed. Over the years we have created many shaped wedding ring designs, now visible in our online gallery. Don’t worry if you cannot make the journey to visit our showroom. Aside from our dedicated shaped wedding ring appointments, we help clients overseas in many countries. Ultimately we need to work with your actual engagement ring, but we offer help on how to send us your engagement ring. Why do we need your engagement ring to work from? When we create a bespoke shaped wedding ring, we either 3D scan your engagement ring to build a CAD shaped wedding band or we hand carve a wax model to fit your engagement ring. For this, we need to work from the original engagement ring. If you are located in the UK, we can help insure an expensive engagement ring and advise when sending the ring to our showroom. Creating a wax model to form the basic ring design. Shown here with the Tiffany Ribbon engagement ring. If you need a little inspiration ahead of getting advice, we have many designs created through our bespoke service. In addition, we have additional designs which are pre-designed styles. 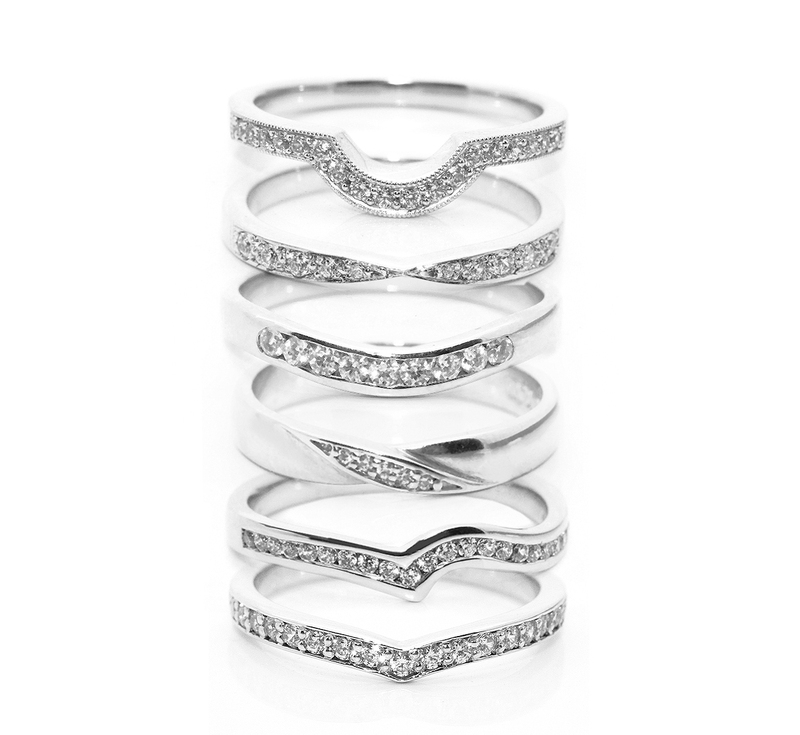 A large proportion can be tried (or borrowed) to see if a design fits to your ring. Ultimately this method takes a little trial and error. 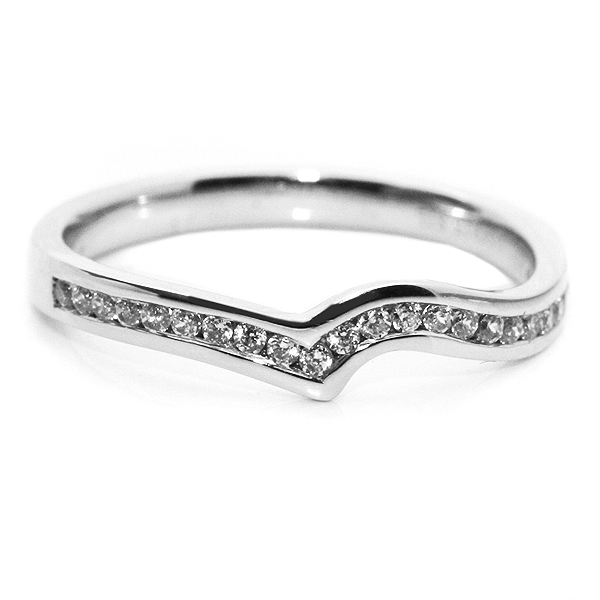 The Tiara shaped wedding ring design features a crown of diamonds styled into a shaped wedding band. This can work around most engagement ring styles. We have existing designs in addition to the option of creating a bespoke version of a Tiara shaped wedding ring perfectly fitting your engagement ring style. 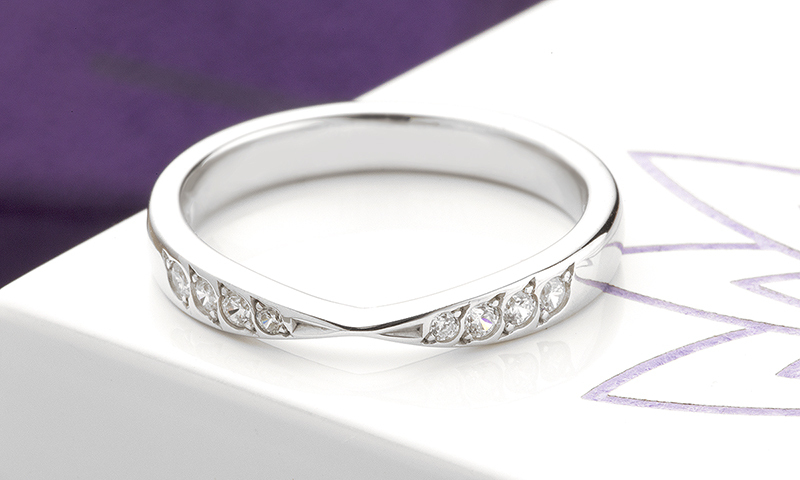 It is possible to create a perfectly fitting shaped wedding ring set. 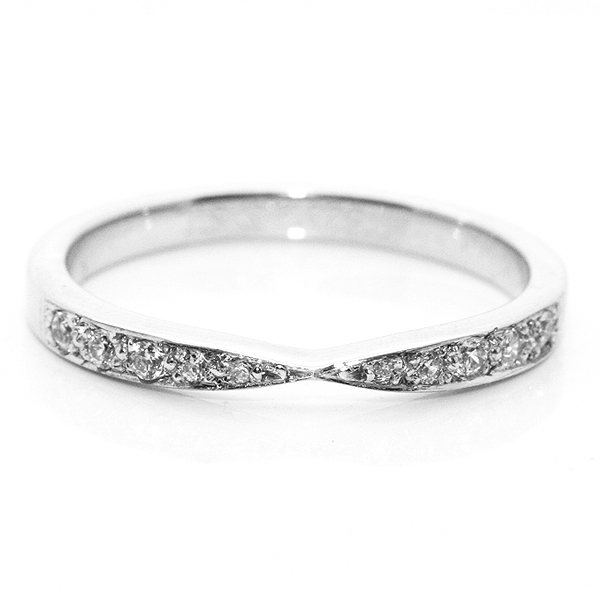 Some clients request a shaped set to include a shaped eternity ring in addition to the shaped wedding ring. This typically mirrors the shaped wedding ring with or without diamonds. Both rings can be created either independently at different times, or they can be made at the same time. 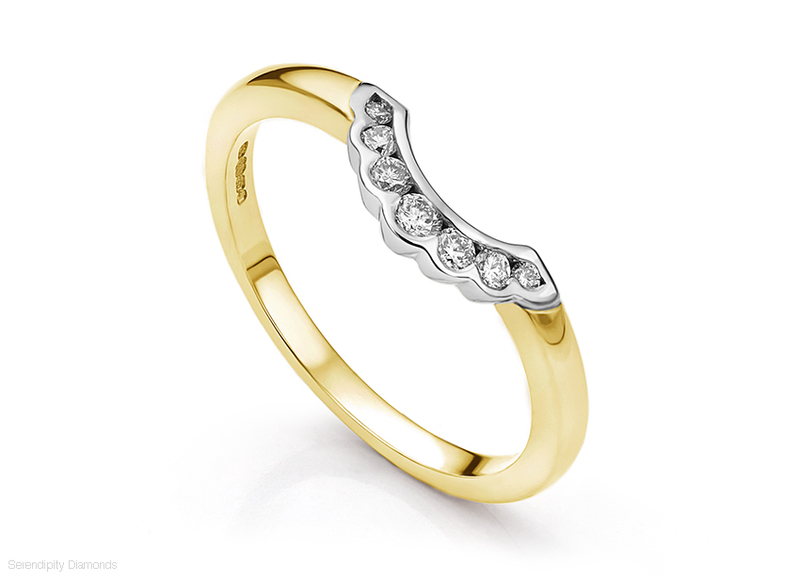 Firstly we have a beautiful horseshoe curve to a fitted wedding band, allowing for a generous engagement ring setting. This style curves around a pronounced setting would match nicely with an engagement ring with the same mill-grain edging, where small beads of detail can be seen around the ring. Typical of many fine vintage ring styles, the design gives a feeling of elegance and vintage chic to the ring. The diamonds in the ring are approx. 1.2mm in diameter and span a sensible length of the upper section of the ring, ending where typically the diamonds would be out of sight. 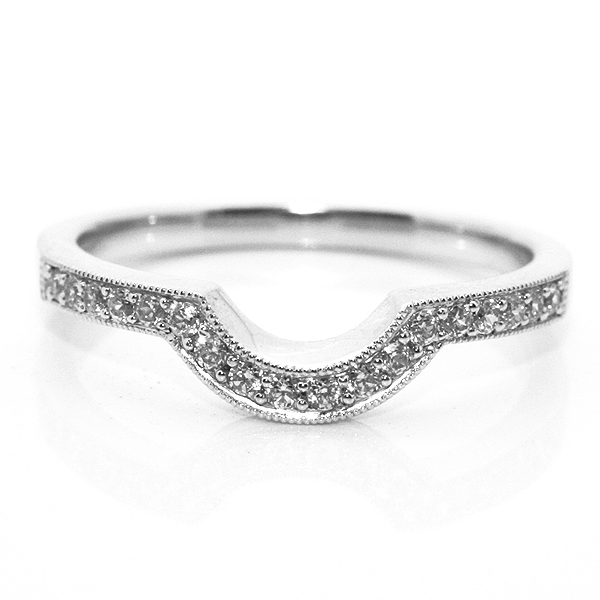 Horseshoe-shaped wedding ring with a scalloped diamond setting. The bow-tie is extremely popular as it pinches in the middle section to allow for a very slightly prominent setting from an engagement ring. 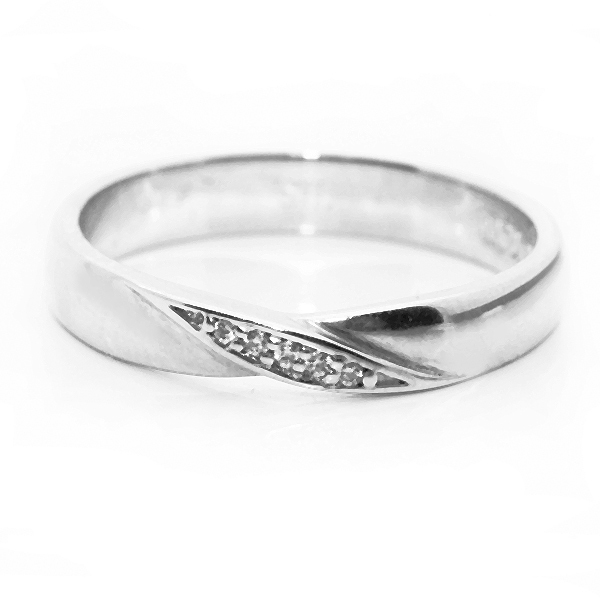 Where ordinarily a gap would exist with a straight wedding ring, this style allows for this but replicates it on the opposite side as a design feature. The wedding ring has a beautiful addition of sparkling diamond accents that graduate inside in an elegant border and grain setting, giving a further dimension to the ring. The design is not weighty or overbearing but fine and slender. 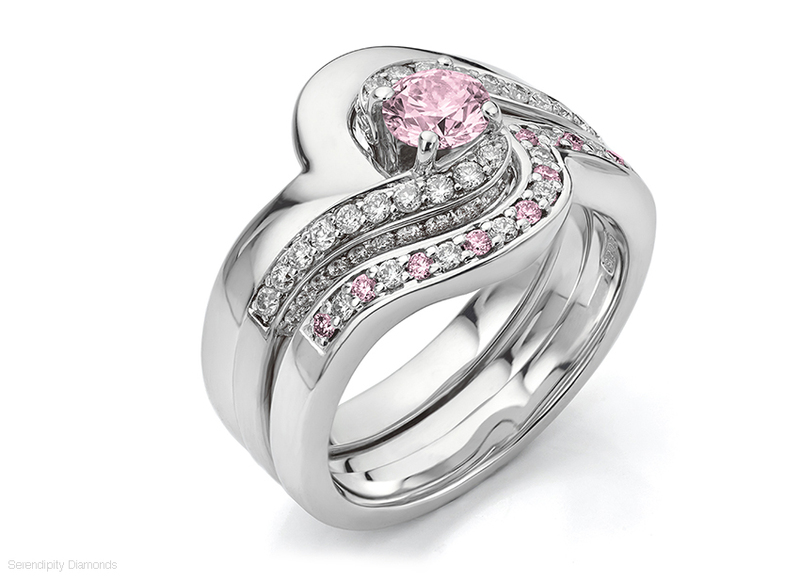 A perfect and very pretty design that would suit many engagement ring styles. The diamond sweep is a very effective style when creating a contoured ring that is needed to flow around a twist style of engagement ring such as R1D002. The style drops away further on one side, reaching around the twist setting and producing a lovely flowing feel to the ring. The addition of small channel set, full cut diamonds balances beautifully with a brilliant cut diamond in the engagement ring itself. The result – a stunning combination across both rings. Curved wedding rings of one type or another vary considerably. 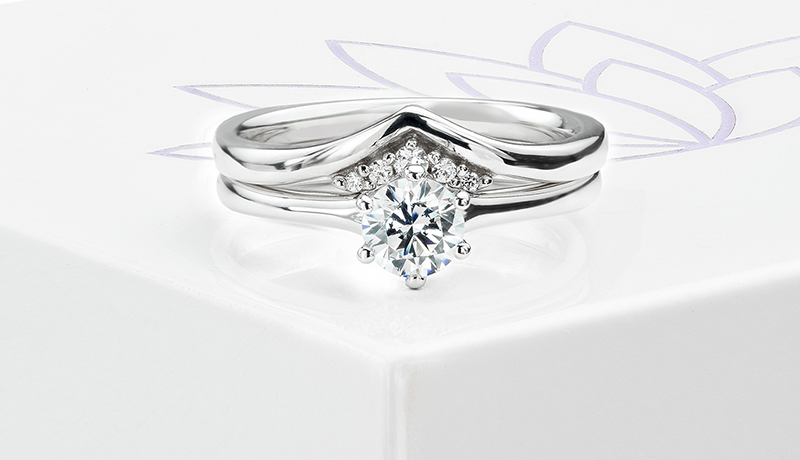 We have been approached in recent years to produce variations of this design with a gentle diamond curve. As with the bow-tie above, the style works very well where only a slight contour is required to alleviate any gap that would exist if a straight band was used. The diamonds are channel set and flow around the set in a very graceful fashion. Some clients purchase our diamond bubble rings as engagement rings. Consequently many such designs demand a shaped wedding ring to be created ahead of marriage. We apply a faithful shape with a matching design to fit against the bubble ring shaped faithfully to the engagement ring. 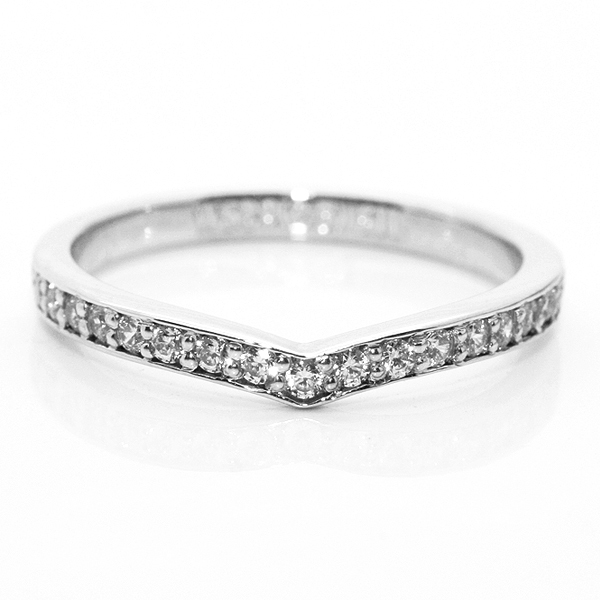 A long-standing classic amongst shaped wedding rings, the herringbone-shaped diamond wedding ring literally points out from the central line of the engagement ring diamond. Working around the setting it almost pinches each side of the shoulders and gives additional form, in contrast to the diamond curve. It lends itself well to engagement rings with more pronounced outlines and can be intensified to fit around Marquise settings, to note one very apt instance. 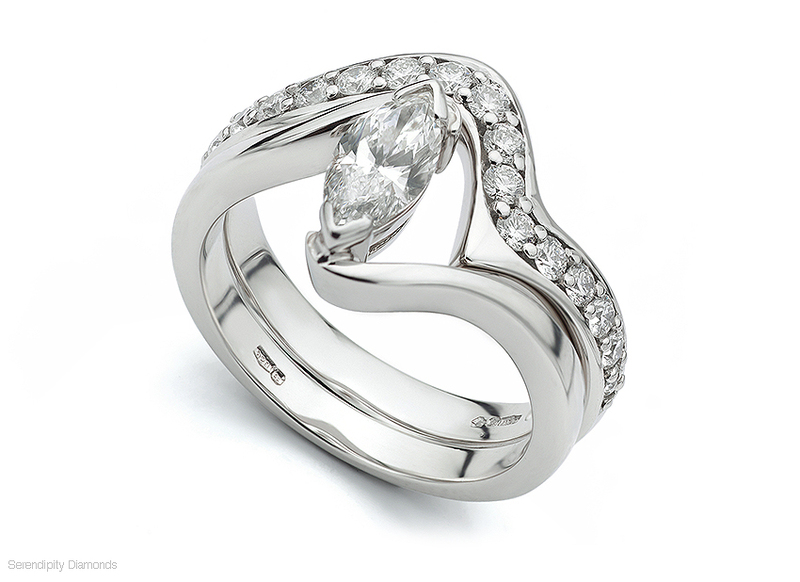 Diamond twist wedding rings can be extremely difficult to source. Over the last decade we have created shaped bands to fit almost every type of twist setting. 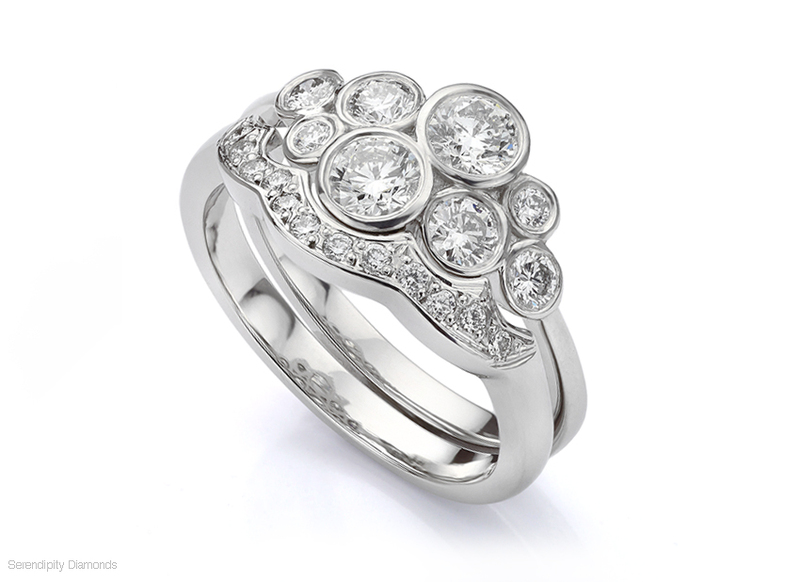 From round twist engagement rings to sizeable Marquise twist rings such as the Poppy engagement ring style below. The following images are a few of our older photographs taken of shaped wedding rings some time ago. 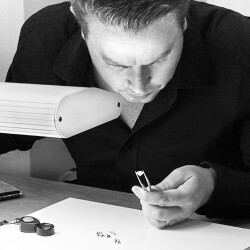 Our recent photography has improved dramatically, offering greater detail for our completed shaped ring commissions.